Our boar left the farm in January. He had a little work to do, covering the sows at a neighbors farm. He returned the other day. 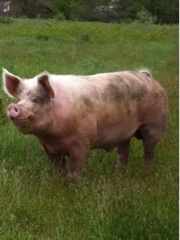 When he left he was about the same size as our sow. Now he is substantially bigger, longer. Our estimates are 6 feet of bacon. 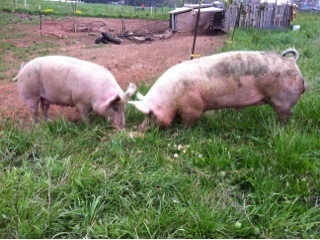 In a couple of months he will go to the butcher in the meantime he is back to work clearing grass along our fence line. Delightful to see a pig graze. He is now a barrow, just working the grass and nothing else.